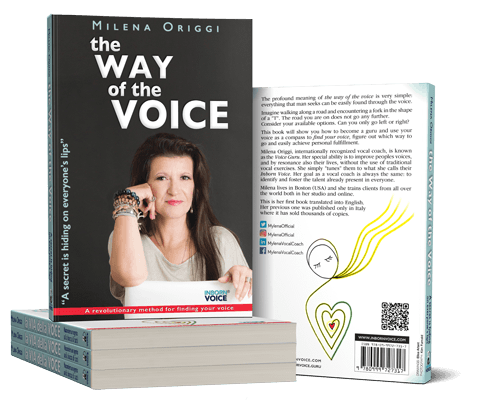 I am Mylena Vocal Coach and I have dedicated ALL my life to the study and to the teaching of the awesome instrument called Voice. I work with the voice from a three hundred and sixty degree point of view and my works now is divided between Europe and United States, thanks also to the telecommunications facilities and the Online Lessons. Actually I live in Boston, that’s why I reach you with this video. Many of you may think that all my work is limited to the world of Singers the highest level reachable by human voice yet my skills are more and more frequently requested by business leaders actors and ordinary people that recognize that they have some sort weakness in their voice. Roberta has asked me to prepare a little contribution for her seminar to help her students figure out the magic that is possible with the human voice an instrument able to transport the full complexity of an idea, a feeling, from person to person. Today, in the digital era, is very difficult to put in practice the theories that the communication expert develop observing the ones that have the privilege of having a great communication skills. In fact knowing a theory is not enough. It’s not even enough trying to put it in practice. In order to be effective, a communication must be made with a Voice able to be consistent with the chosen message. Probably each of you is using his voice without any kind of awareness. Any voice training that you are experiencing, day after day, il mostly left to chance. What if I tell you that many of the results you will face in your life is closely linked to the way you are using your Voice? Every key moment of your live was, and always will be, linked to a form of voice communication. I will try to let you grasp the importance of the practical side of the voice with some examples. None of you have forgotten to silence your cell phone! I’ve made this little joke to help you understand that even listening is part of a communication. Each one of you has reacted, with a greater or lesser awareness, while hearing this simple sound. Try to imagine what influence can have on each of you the sound of the human voice something capable of producing sound more complex that any musical instrument yet invented. Figure out the sound of a simple greeting, the first word exchanged between the people. but I prefer to let your imagination work for me. but what happens when you try to put it in practice? Probably many results will be miles away from expectations. Why our imagination is able to conceive something that seems so difficult to put in practice? Where then does this difficulty come from? Obviously the answer is quite complex. A case, easy to understand from everyone, maybe this one. How many times you have been asked to be quiet or to lower your voice when was not necessary? This, and other socials behavior have produced an effect in your voice. You have forgotten how to use your voice and its full range of expressiveness. You are still doing this, right now. You could say that while growing, you have learnt how NOT to use your voice. Yet speaking is an integral part of our life, we take it for granted. We notice how important is our Voice only when a laryngitis take our Voice away or we develop even worse voice problems. I’m are here to help you view yourselves as something new and to rediscover how much te theoretical part of a communication require a supporting Voice, not because you are seeking personal success or a career improvement but because you want to establish a better living. It is not enough to be prepared, to be well dressed to have the state of the art mobile phone or the newest car. This are only part of an illusion created by a bad magician. The real magic is in your Voice. I would like to reach the end with a practical example so every one of you can understand the relationship between voice and success or failure when the communication is done by person. You can close your eyes if you wish to. Imagine ad exam, here in this prestigious University. You are a spectator of someone getting is oral exam. You have never seen him before. The first candidate seems very comfortable, and he answer to each question arguing with some kind of “savoir faire”. The score received at the end of the exam is a surprise you find it better that the one you expect. Another candidate seems quite nervous yet he answer to every question going straight to the point. Even this time you are surprised by the score received you find it less than expected. This could be the difference between having the ability to communicate and unsatisfactory results. You don’t have to know perfectly a theory, you have also to be able to communicate it to the others in the practical aspect. This will happen every day of your life, in every communication. Friends, job interviews, family ,and even love. Every and each time the leader will not be the best one but the one who has been able to communicate effectively with the others even if it was less prepared, “beautiful” or whatever. This is ultimately the difference between knowing something and being something. I speak to the world through my clients. Thanks to Roberta for this opportunity and all of you for your precious time.